The Football Association believes it has set prices at a "sensible" level for the FA Cup final between Manchester United and Chelsea on 19 May. The event returns to Wembley after the stadium was rebuilt and tickets will be £35, £60, £80 and £95, with a limited number at £17.50 for under-16s. 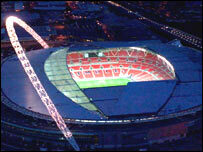 "It was important to set ticket prices at a sensible and affordable level," said FA chief executive Brian Barwick. "We believe these are very competitive for what will be a historic match." Manchester United beat Watford 4-1 to reach the final, while Chelsea booked their Wembley place with a 2-1 extra-time win over Blackburn. Chelsea were the last winners of the FA Cup when the final was played at the old Wembley. They beat Aston Villa 1-0 in 2000. Both clubs will decide on their allocations after meetings this week and tickets will then be sold via Chelsea and Manchester United ticket offices only, with no general sale. However, the Football Supporters' Federation believe the lowest ticket price should be between £15-20, not £35. Chairman Malcolm Clarke said: "That would have been quite reasonable. The two clubs could certainly afford it. "Football in general is rapidly pricing itself out of the reach of a lot of ordinary supporters and this is just the latest example."